I haven’t ever given much thought to talking about or photographing food – I’m the kind of gal who can eat spaghetti and cheese seven nights a week and never complain – but Kevin has convinced me that some of you out there may be a little more curious about the Georgian cuisine than I appear to be (though don’t get me wrong, I love the food here too!) so here is your obligatory post about food. The “Georgian Snickers:” This candle looking treat is one of the best cycling foods I have ever encountered, and I really wish I could find them throughout the whole world. 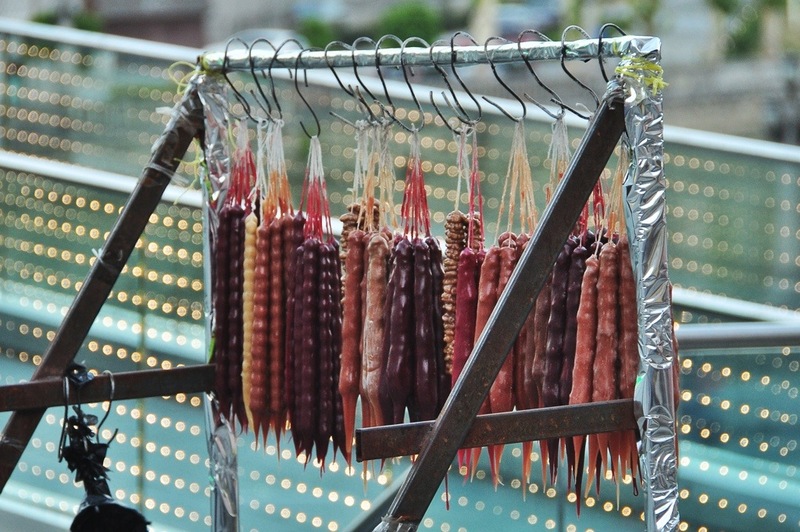 They are made by stringing walnuts onto a string and then dipping that string into a thick grape syrup before leaving it out to dry. The outside then turns into a sort of thick, slightly different more juicy, fruit leather surrounding the nuts. They are tasty and filling, and best of all, can be kept for months and don’t go bad in the heat. It’s like a natural funny shaped power-bar that tastes a whole lot better. The Brick: Since I have no idea what this is actually called, I usually refer to it as “the brick of goodness,” which is exactly what it is. It’s made of crushed sunflower seeds and honey and since it’s so sweet we normally only eat little pieces at a time. We have also taken to adding it to our oatmeal. Like the Georgian snickers, this is a great cycling treat because it stays good for as long as you like and doesn’t go bad with heat. 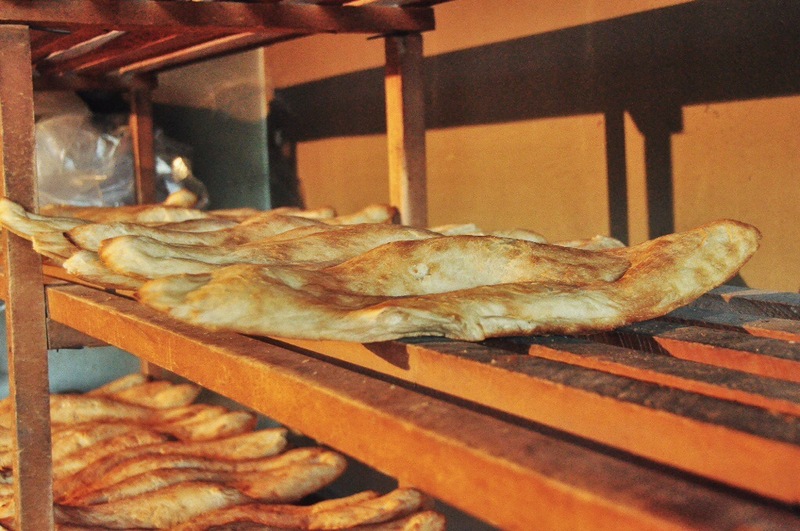 Katachapuri: This is a very typical Georgian food that seems to be eaten at every picnic and is easy to find at bakeries throughout the larger cities. 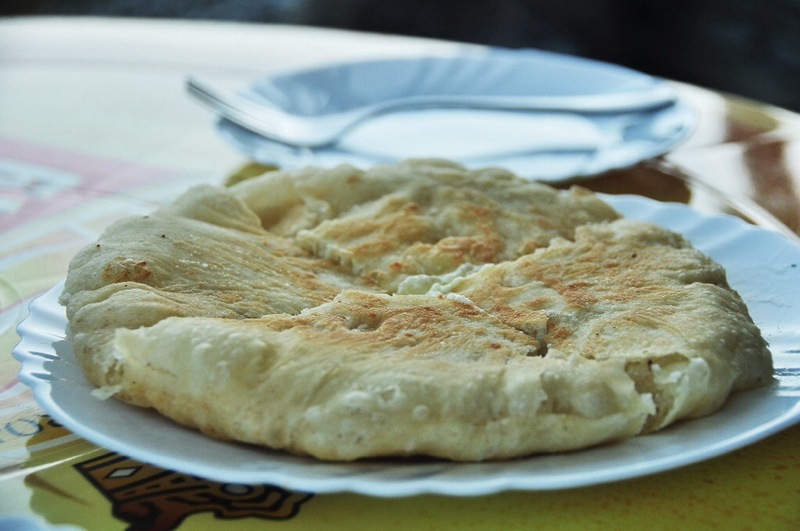 Though it varies a bit from region to region, it’s basically bread with a whole lot of Georgian cheese melted into the middle. Though it also varies in price, we have found it for as cheap as fifty cents (and as expensive as two dollars). And yes, it does taste as food as it looks. 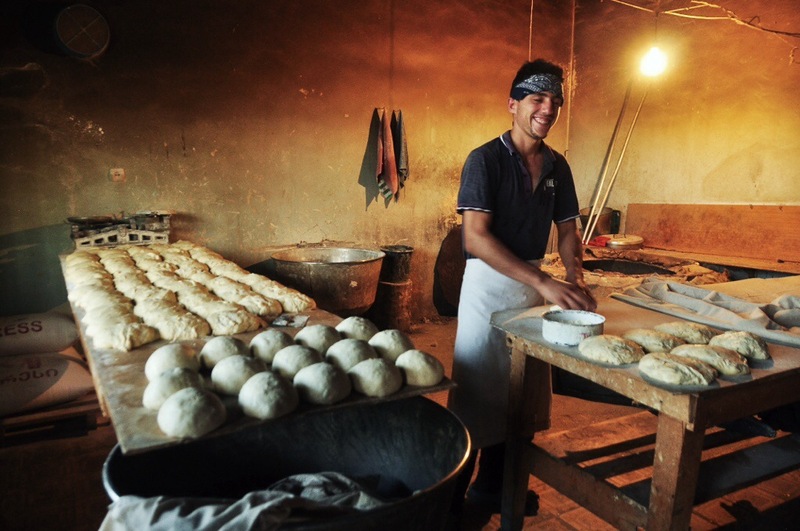 Georgian Bread: I love the fresh Georgian bread that we buy practically every morning, and like I have talked about before, I also love how they make it. It’s cheap (thirty cents) and delicious, and very easy to find because even the smallest villages or shops sell this bread daily. The one unfortunate part is that the bread doesn’t stay good for more than a day, and even after a few hours it looses it’s fresh taste. I usually eat it with Georgian cheese, another homemade speciality of the country. Fire Cooked Meat: As I have mentioned before, there is a huge picnicking culture here in Georgia which always involves meat cooked over a fire (very fatty pig if I’m not mistaken). We have now eaten this at nearly a dozen picnics, and along with onions and a homemade sauce, Kevin and I have come to really appreciate this delicious meal. I realize that the photo below is of fish (not the typical pig meat) because I haven’t taken a picnic picture yet. 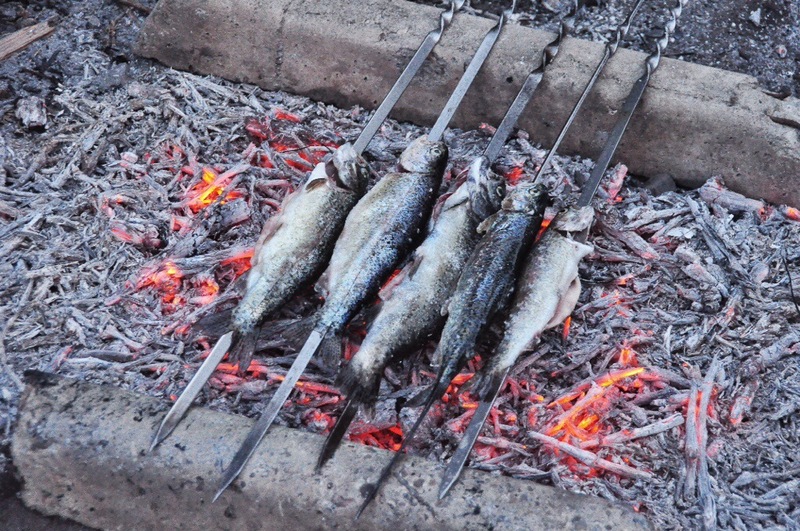 This fish, which we made at a wonderful homestay with a grandpa and his grandchildren, was cooked the same way they cook their picnic meat though. Rincali: These meat filled dumplings also seem to be very common throughout Georgia. They remind us a lot of ravioli back home, though the true Georgian ones are much larger (you only eat four or five for a meal). The picture depicts the smaller ones (from Turkey if I’m not mistaken) which are also very easy to find. And as you can see, they often eat them with sour cream. Fruits and veggies, especially those in season (during the summer this includes: tomatoes, watermelon, peaches, and aubergines) are also very cheap and easy to find so we eat quite a lot of those. 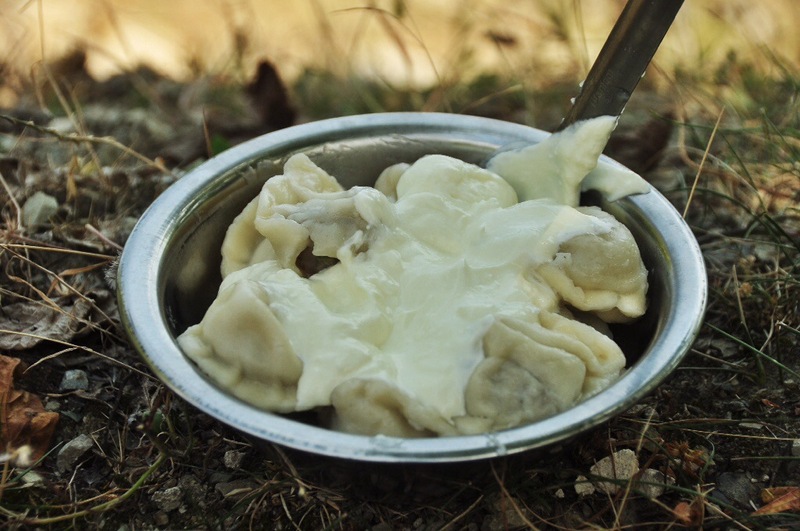 More about our home cooked backpacking food in the next post though! This entry was posted in Georgia and tagged cycle around the world, cycle touring, food in gerogia, gerogia cuisine, what to eat cycling by The Wandering Nomads. Bookmark the permalink. Thank you, Kevin — he is right! 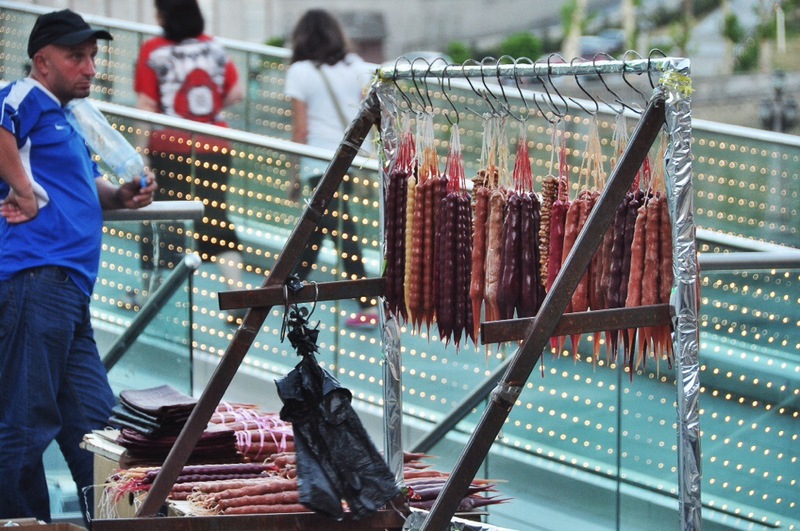 Food is such a key to a culture. Yum. 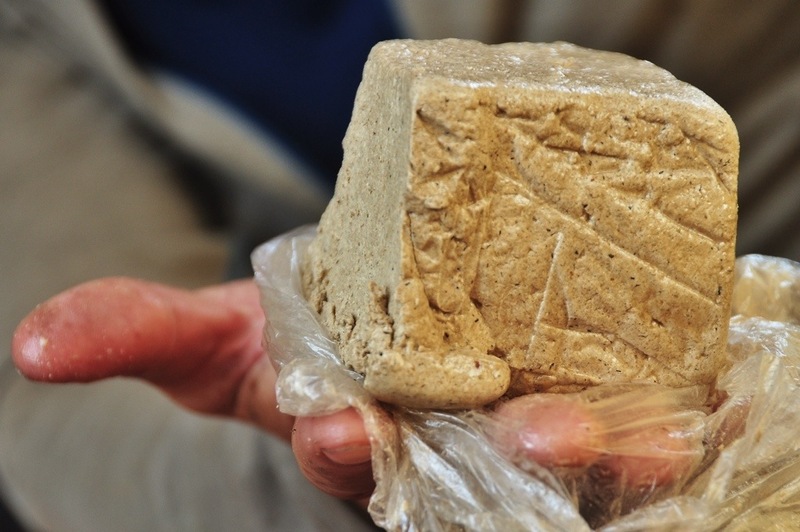 What you named the Brick looks like Halwa, the middle eastern sweet made from sesame seeds. I looked up and it is indeed a variant of Halwa. Halwa is a totally different sweet in India, made from flour, sugar, and butterfat. In fact, the tradesmen who make sweets are known as Halwai in No. India.